In this post we will be taking a look at some of Photoshop’s useful tools that make real life at the desk a little easier. The first one we’ll look at is having more control during the image sharpening process. 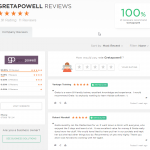 Since Autumn 2018 Greta Powell Training Reviews are now gathered and collected by Reviews.co and can be viewed on their site. These have been written by both new and existing clients. Although much of the training is delivered to private clients I still deliver design training courses for some training companies. Again you can take a look to see what they have to say about courses that have been facilitated by me. Don’t have a good day, have a great one. This Graphic Design Course is designed to fast track you into design using the main applications – Photoshop, InDesign & Illustrator. On it you will learn the process of enhancing and manipulating photography, work with layout and design your own vector artwork. The course is onsite at your premises. This can be virtually anywhere in the UK including the Midlands, Leicester, Derby, Birmingham, Lincoln, Nottingham, York, Oxford and all cities across the UK. These Graphic Design Courses are perfect for both 121 sessions and closed company groups and are ideal for companies looking to trim costs by bringing their design in-house. This is a versatile course aimed at those who wish to create, design and publish their own materials without having to rely on external studios. Unless otherwise requested all the Adobe Courses are run at introductory level but according to individual ability these can always be mixed and matched with other level Adobe Courses.